Police in the United States won’t be able to get a wide range of military grade equipment, including tanks and high-caliber firearms, from other federal agencies. The White House has introduced new restrictions prompted by the riots in Ferguson. Under the new rules revealed on Monday this week, state, local and tribal law enforcement agencies are barred from buying or receiving from federal partners such as the Pentagon. This includes: weaponized vehicles and grenade launchers, and less-lethal items such as tactical vehicles, flash-bang explosives. Riot gear can now only be acquired by law enforcers if a list of conditions are met. "The idea is to make sure we strike the right balance of providing equipment that is appropriate and important, while at the same time put standards in place that give a clear reason for the transfer of that equipment, with clear training and safety provisions in place," Cecilia Muñoz, the White House director of domestic policy, told reporters in a conference call, according to the Washington Post. The topic of policing has dominated public discussions since Michael Brown, an unarmed 18-year-old black man, was shot and killed by a police officer in Ferguson, Missouri last year. 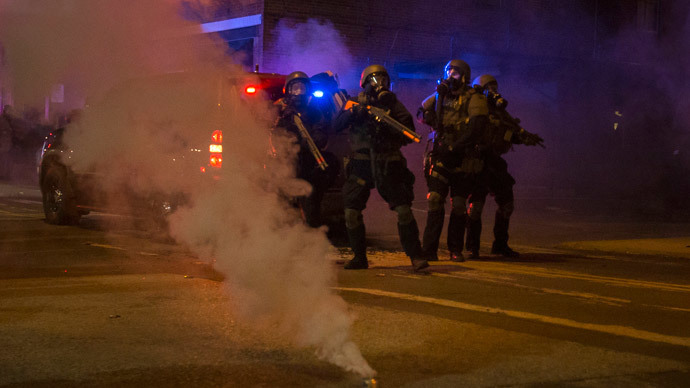 The incident was followed by a wave of demonstrations, which attracted national attention after the Ferguson Police Department and other regional law enforcement groups responded to the protests clad in riot gear and equipped with high-powered weaponry more fit for a battlefield than a St. Louis suburb. President Obama responded to concerns surrounding the use of militarized equipment by small-town police officers by assembling a working group to examine the topic. Their findings have now been released in a report that forms the basis of the recommendations contained in the fact sheet published on Monday, where the Ferguson events are singled out specifically. Obama to restrict federal grants for police purchase of armored vehicles, grenade launchers, but NOT for military spy gear like StingRays. In Ferguson, the group says: “The law enforcement response to those protests was characterized as a ‘military‐style’ operation, as evidenced by videos and photographs that showed law enforcement officers atop armored vehicles, wearing uniforms often associated with the military and holding military‐type weapons. In addition to establishing lists of prohibited or controlled items that can no longer be acquired through federal programs or grants, the working group also recommended that law enforcement agencies wishing to use certain equipment must adopt and adhere to specific written policies and protocols, as well as training and other guidelines. Speaking from Camden later in the day, Pres. Obama said that the militarized police response that unfolded in Ferguson and more recently Baltimore can “alienate and intimidate local residents” and give the impression of an occupying force, not one meant to serve and protect.